Jan 28, 2015 • [By Jenny Woodman, Earthzine] When viewed from space, clouds largely obscure the Earth. It isn’t a matter of time of day, angle or distance. It’s just the way it is – unless, of course, you are gazing at the planet using Google Earth. 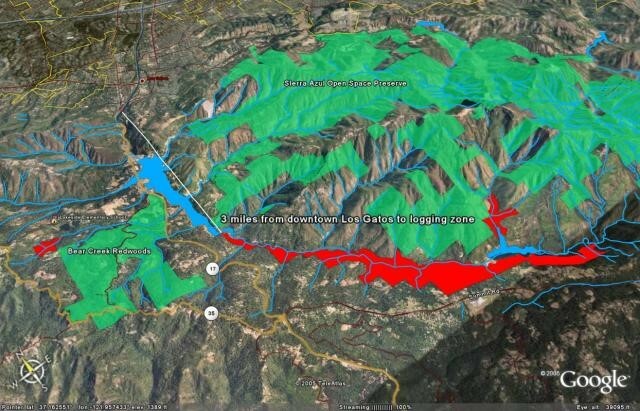 The story of how Google Earth offers images of the planet — without letting clouds get in the way — began in the foothills of the Santa Cruz Mountains in California. 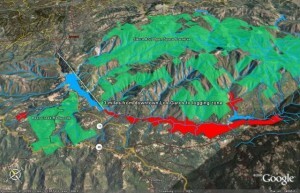 In the summer of 2005, Rebecca Moore came home from her job as an engineering manager at Google and found a legal notice in her mail that notified local residents about the San Jose Water Company’s plan to harvest timber in their community, which is part of the Los Gatos Creek Watershed. The notice included a map that didn’t make sense to Moore, who describes herself as a “map geek.” After studying the map without much success, Moore decided to plug the information into Google Earth, which had been released two months earlier and was still somewhat of a novelty. Moore punched data from the map into the program, and added information on the location of local schools and landmarks. What emerged from her efforts was a clearer picture of a logging plan using helicopters to remove timber because the valley walls were so steep. “They were going to be helicoptering over the community, in perpetuity,” she recalled. At a meeting where Moore showed 300 members of her community what the proposal entailed, people gasped when they realized what was really at stake. “The plan was 400 pages; no one reads that – here you see it in seconds,” Moore said, pointing to the image on her laptop screen. After a protracted two-year battle, Moore and her compatriots were able to stop the logging by proving that the company’s plan posed significant environmental dangers, and was ultimately illegal. Moore convinced the execs at Google to let her spend one day a week acting as a liaison with environmental groups and teaching them how to use Google’s mapping tools. At the time, Google had a program that allowed employees to volunteer for such efforts. Moore’s project was called Google Earth Outreach (GEO). In 2007, Chief Almir of the Paiter Surui tribe in the Rondonia, Brazil, contacted Google through the Amazon Conservation Team (ACT) asking for help. Almir wanted to teach his people how to use technology to protect the rainforest from illegal logging, and to map their sacred cultural sites in order to help connect people outside of the Amazon to their work and their plight. Almir discovered Google Earth while visiting an Internet cafe. Moore and her team set up a training program in Rondonia. Many of Almir’s people had never even used a computer, so they were taught the basics of Google Earth. Tribal youth were trained on how to use digital photos and YouTube to tell stories, which were uploaded to a Google Earth map of the region. Once the mapping project was complete, the Pater Surui wanted to continue their efforts to fight logging. Moore and her team returned to the region in 2009 and trained the tribe to use smartphones equipped with software that would allow them to collect data from the forest and submit the data to Google Earth. Vasco Van Roosmalen, director of ACT, explained, “The Surui use [the data] to monitor their biodiversity, to monitor their borders, and also to monitor their forest in the context of climate change.” The tribe is able to measure how much carbon they are preventing from going into the atmosphere by maintaining the forest and replanting with new saplings. The Pater Surui have an ambitious plan to plant 100 million saplings by the end of 2019 in an effort to reforest the region. While Moore and her team were there with Almir, she was approached by Carlos Souza Jr., a Brazilian geoscientist from Imazon. Souza was looking for a way to quickly and efficiently process the satellite data used to observe and prevent illegal logging in the forest where they were losing more than 1 million acres of rainforest each year. He asked Moore if Google could create a technology that would allow researchers to analyze the data. 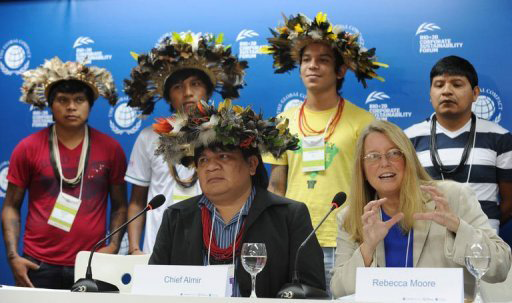 It took Moore and her team three years, but they were able to design the Google Earth Engine, a platform that could process copious amounts of data for Imazon’s Deforestation Alert System in a timeframe that would allow Souza and his colleagues to see illegal logging from the satellite data, send people out into the field to confirm, and then notify the authorities. According to Imazon, they were able to reduce illegal logging by 97 percent between 2007 and 2010 in Paragominas, an area where deforestation was happening on a large scale. “There are all these NASA satellites up there right now collecting incredibly useful data. 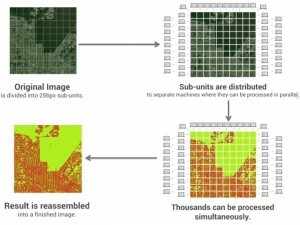 The Landsat instrument is collecting 600 images a day – there’s more than 4 million images over 40 years,” said Moore. She and her team realized that if they could figure out how to efficiently process this data, they would be able to open a floodgate of information for important science and Earth observation. Up until this point, these data were expensive, but in 2008 the U.S. government made all of the Landsat data free. They took this treasure trove of data that the U.S. Geological Survey was storing on tapes in a secure archive in South Dakota and put it online in Google data centers. 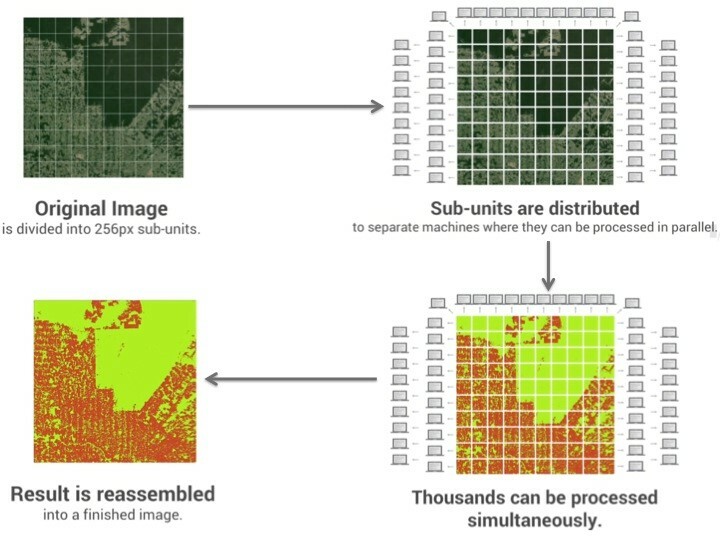 Once the data was free, scientists could access it, but how do you process so much information? For each spot on the planet, they used Google Earth Engine to sift through all the images and find the best pixel for each point, and reassemble the pixels to create clear, cloud-free images. “This would have taken like 300 years, but we did it in one and a half days,” Moore explained gleefully. Google Earth Engine, in partnership with Time magazine, used these cloud-free images to create timelapse videos of Brazilian deforestation, glacial retreat, and urban expansion. Moore is beyond enthusiastic about the potential for Earth observation and science that this platform makes possible. She pulls up image after image on her computer to show what kinds of observations are possible – from precision agriculture and drought monitoring to predicting hazards that emerge when conditions are ripe for mosquito hatches, a common disease vector. This entry is filed under Data, Forest Management, News.